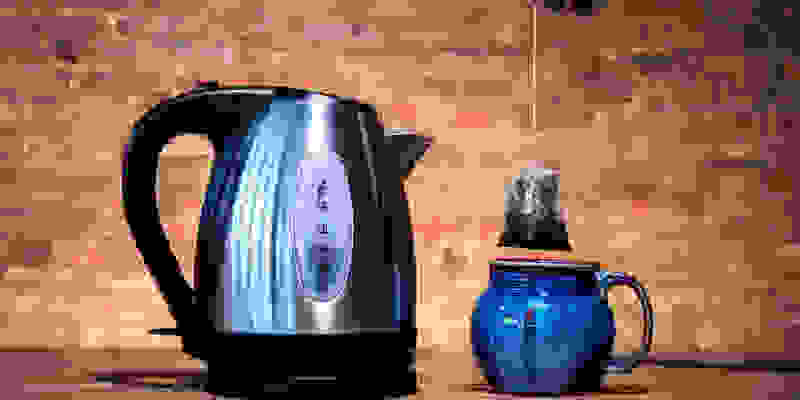 There’s no denying the convenience of an electric kettle, but with so many on the market, how can you know which to buy? 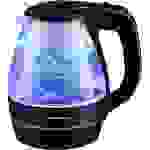 We did the legwork for you by testing the market’s hottest… er, best electric kettles to find the only ones worth buying. If you're anything like us, you want that water running through your French Press ASAP in the morning, so we checked for ease of use, simplicity, and above all, speed. 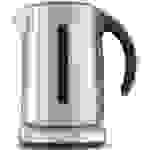 There are a lot of tea and coffeemakers out there, but most of the kettles we looked at were strictly for boiling water. 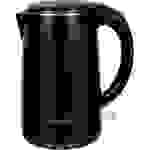 Whether you drink tea, coffee, or cocoa, these kettles are ideally designed to deliver that hot water quickly. However, some perform the task better than others. Read on to see which ones are worth the investment—like the Cuisinart PerfecTemp (available at Amazon for $70.99)—and which are just full of steam. This kettle may not look like anything special, but it does its job exceptionally well, and at a very fair price for what it offers: Six preset heat settings for steeping tea and easily discernible, intuitive buttons. Simply select your desired temperature and press start, and in a snappy 5 and a half minutes, a series of beeps will let you know that your water is boiling. The machine automatically flips to a handy keep warm mode that resumes its cycle regardless of how many times you remove the kettle from the base. 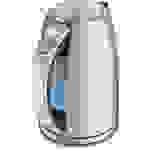 This kettle is easy to use and speedily effective, earning it our top spot. It's likely that you have at least one Hamilton Beach appliance in your house, and if Amazon reviews are anything to go by, this kettle is wildly popular—and it's easy to see why. It’s reasonably priced and was one of our fastest boilers, heating one liter of water in just over 5 minutes. It performs like a simplified version of our top pick; where the winning Cuisinart kettle has multiple temperature settings, this Hamilton Beach has just an on/off switch, and the kettle switches off instead of beeping when the water is done. If you’re low on counter space, this kettle is among the most compact and unobtrusive on our list. It's the second-cheapest pick but performs like a much more expensive kettle, so it earns our value pick. 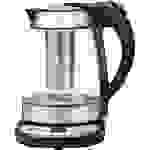 Pre-boil—How easy was it to assemble and fill the electric kettle? How helpful was the manual? How easy was it to use the controls? Boil—How easy was it to pour out the boiling water? Did the boiling water stay in the kettle, or did it spill out at any point in the boiling process? Was there a boil notification light or sound? 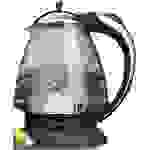 Post-boil—How easy was it to clean and store the electric kettle? Does the kettle look nice, like it's worthy of gracing your kitchen counter on a day-to-day basis? 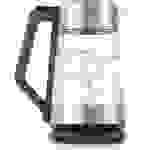 Overall, how easy was it to use the electric kettle? Using carefully conditioned water, we also measured how long it took for each kettle to boil 1 liter of water. The whole point of these electric kettles is that they're supposed to be faster and more convenient than traditional stove-top kettles, so the kettles that boiled the fastest and were the easiest to use topped our list. This is the most expensive kettle of the lot, but it’s easy to see why—it pulled ahead of the pack in every one of our tests. It has the most ergonomic raise-lid button, and instead of springing open, the lid has a slow, controlled raise. The kettle is intuitive to use, with five clearly marked brew and programmable temperature settings, plus a 20-minute keep warm feature. It was also one of the fastest boilers (taking just over 5 minutes to reach a boil) and we like the way it beeps to alert you that your water is ready, rather than quietly shutting off like most of the kettles we tested. If you're serious about tea, this is a great pick—However, the Cuisinart earned our top spot because it’s substantially cheaper while still having all the same bells and whistles. The Cuisinart takes 15 seconds longer to boil, but if saving money is your top priority, those extra 15 seconds shouldn't bother you too much. If you want a glass kettle that offers quick results, this may be your best pick. This OXO kettle placed second in our boil test, bringing a liter of water to a rapid boil in just a hair over 5 minutes. There is just one temperature setting (on/boil), though if you want more control, there is an adjustable temperature model available. This kettle is over 1 foot tall, making it one of the tallest we tested, so be sure you have enough cabinet space to stow this one. This curvy, teapot-reminiscent kettle is one of the most attractive and space-efficient of the lot, but does it stack up in usability? It boils water extremely quickly, but there is only one setting and the light that indicates that the kettle is preheating/on is difficult to see. 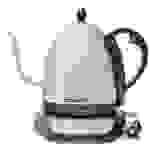 There is no boil notification beyond the kettle switching off and it lacks an easy-press button to pop the lid, meaning it takes more effort to remove. Unfortunately, the steam from pouring hot water makes the lid hot and slippery, which can make removing it precarious. But if you're sold on a glass kettle, this is the best of the four we tested. This is an Amazon best-seller, but to be frank, it's also the ugliest kettle of the lot, thanks to its cheap-looking plastic construction. The kettle is huge despite only holding 1.7 liters of water. There is only a max-fill line but no tick marks to help you measure volume, so we had to use another vessel to measure water. However, it boils water faster than any other kettle we tested (just under 5 minutes) and stays cool to the touch throughout the process. If you prioritize speed or if you want to make sure your kids won’t burn their hands on the kettle, this is a good pick—just be sure you have abundant cabinet space to stow it in since you definitely won’t want to display this one. This model is an Amazon best-seller, has curbside appeal for its fun color options, and is the cheapest kettle on our list. Unfortunately, it's also slow to boil, and simply shuts off when the water reaches a boil. Additionally, there is a screen at the opening that sticks out at an awkward angle, making the kettle tough to fill in the sink. While we don't hate this model, it's nothing special. This kettle's clear glass makes it great for those who want to see exactly what’s going on, and the ring of blue light on its base makes watching water boil oddly entertaining. While it does come with a tea infuser, the downside is that there is just one setting (on/boil), and the kettle simply switches off without warning when it reaches a boil. That means this may not be the best pick for tea-lovers who need specific temperatures for various leaves. Additionally, the Chefman was one of the slowest to boil, taking more than 7 minutes, and we didn’t like its bulky appearance. This bare-bones kettle is low on our list. This is undoubtedly the most attractive kettle we tested, but upon picking it up, we were surprised at how light it was. The stainless lid feels chintzy and scrapes in a nails-on-a-chalkboard way when placed and removed. 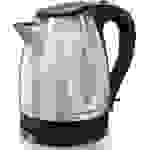 The kettle only holds 1 liter of water and only has one measurement marking for max fill. 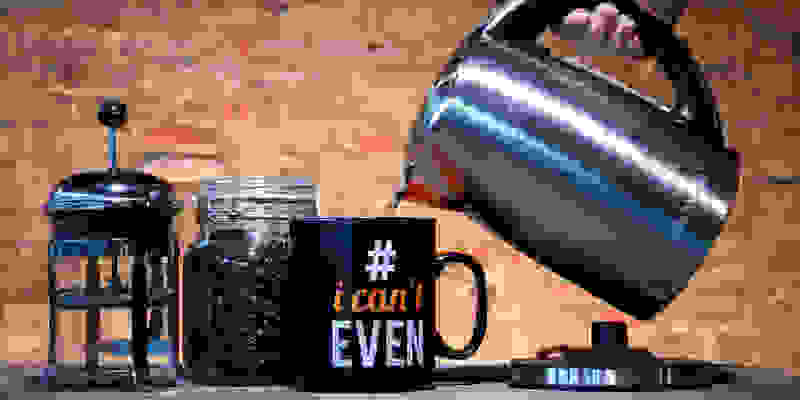 Sure, it offers the ability to set an exact temperature and you can watch the temperature climb in real time, but despite it being the smallest kettle we tested, it took ages to boil. It also lacked a clear notification when it did so; it finally, confusingly turned off after 8 and a half minutes. And while you may think the narrow gooseneck spout would make it easier to pour, the design actually makes the stream harder to control: This was the only time we missed our teacup in testing. In this case, beauty does not outweigh functionality. Skip this kettle—you won’t regret it.